Back before its official unveiling in January, I wrote a series of articles about Apple TV née iTV. I was convinced that both the iTV and the iPhone would both be close cousins to the iPod internally, and that the iTV was certain to be basically an iPod with improved video output and wireless 802.11n capacity. I was wrong on that point; the Apple TV functions like an iPod in many respects, but it’s a full computer running Mac OS X, not just an iPod with extended features. While the iPhone appears to be an embedded ARM device, the Apple TV is very simply a cheap Mac designed expressly to power your TV. Of course, end users don't care about the insides; to them, it only matters that the Apple TV does what it is supposed to do. However, the inside details do matter for a couple of good reasons. One is technical, the other is economic. 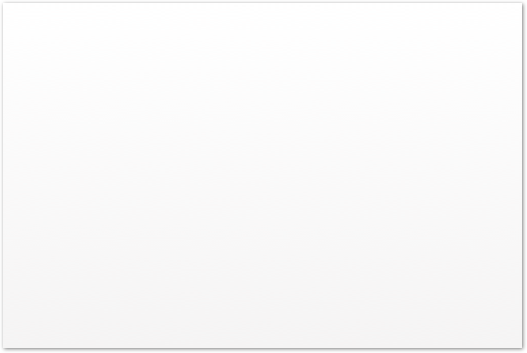 On the technical side, the Apple TV's straightforward design makes it easy for users to modify, hack, and extend because Mac OS X is well known and documented. The core OS is even available as the Darwin open source project. On the economic side, the fact that Apple TV is simply a Mac means that Apple will suddenly start selling 20% more Macs. That will help drive down costs and fund increased internal development work on Mac OS X. 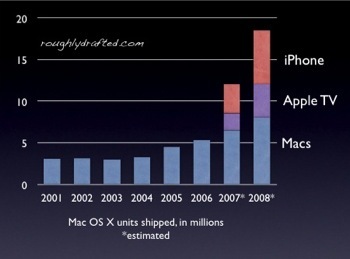 Compared the 3 to 4.5 million Macs Apple has been selling each year since 2000, adding another 1-2 million Apple TV units gives the company a way to dramatically expand its installed base by without cannibalizing sales of its existing Macs. Last year, Apple sold 5.3 million Macs, and is on course to sell over 6 million this year. Sales of the Apple TV--and soon the iPhone--will bump up the number of Mac OS X devices dramatically, help subsidize ongoing development of Mac OS X, and expand the market for developers proficient in Apple’s Cocoa. If Apple meets its 10 million goal for the iPhone by the end of 2008, and meets expectations of Wall Street on the Apple TV, Mac OS X units will jump from 5.3 to around 12 million this year. When Apple began the transition to Intel, it gave two technical reasons for leaving PowerPC behind. One was the ongoing development of desktop processors; IBM and Motorola were both focusing their development efforts on building either server processors or embedded chips for cars and video games. Apple needed processors suitable for desktop computers and workstations; it couldn't match the economies of scale in the PC world on its own. By joining Intel, Macs would get to ride on the same bus as everyone else. Besides equal access to the latest generations of desktop processor technology, Apple also needed something else that wasn't critically important to its PowerPC partners: energy efficient processors for mobile devices. Apple primarily needed new faster, energy efficient processors for its PowerBook and iBook laptops, which were still skating along on the sleepy G4 after five years. Intel was not only making fast desktop processors, but also slow ones for cheap PCs and laptops, and a wide range of devices in between. Apple actually made more public comments regarding the need for efficient processors than faster ones. The Apple TV benefits tremendously from the Intel transition for this reason. Inside, it is essentially a really slow Mac mini. It uses a 1 GHz Pentium M Crofton Processor, a variant of Intel's Dothan. The Pentium M--for mobile--is based upon the earlier Pentium III, not the more recent Pentium 4 design. Pentium 4 was supposed to be a brilliant new chip architecture, using the fresh NetBurst design to achieve blazingly fast speeds. It didn't turn out to be so great in the real world however. While achieving much higher MHz clock timings, it didn't offer a big jump in performance but did demand far more power. After struggling through a half decade of P4 chips between 2000-2005, Intel was increasingly falling behind rival AMD and its faster, more efficient Athlon. AMD’s processors were faster despite being clocked slower. Intel’s high-centered P4 architecture helped to keep Apple satisfied with PowerPC, which was competitive in both speed and efficiency: the G4 was a good general purpose processor, and the G5 was very fast. While the ‘megaherz myth’ focused attention on the clock speed of the NetBurst P4, it was really a failure. In 2003, Intel returned to its earlier 1995 P6 design--used in the Pentium Pro and Pentium III--and started over. The result was the low power Pentium M family and then the new Core brand of processors, which are both fast and efficient. Intel has since both outpaced AMD and left PowerPC behind as a specialized embedded processor. All Intel Macs use variations of the Core architecture, including the Mac Pro desktop, which uses a Core 2 chip sold under the Xeon brand. Because the main processor in the Apple TV doesn't need to do much, Apple underclocks it save even more power. It has 256 MB of RAM, a 40 GB hard drive, and an NVIDIA GeForce Go 7300 video card, which uses 64 MB of video RAM. While it's a cheap Mac, it is designed for a solitary purpose: downloading content to watch on a TV display. That means it has only the most basic input: nothing but a infrared remote control with six buttons. There's no keyboard or mouse, and the USB port isn't yet enabled to allow anything to be plugged into it. 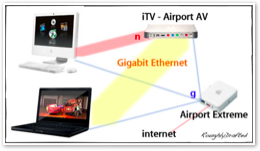 To acquire programming, it has 10/100 Ethernet and a/b/g/n WiFi wireless networking. 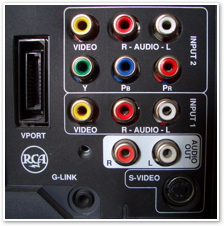 For output, it has standard Toslink optical digital outputs, RCA analog stereo jacks, component video outputs and an HDMI connection, which essentially is a compact DVI port combined with audio outputs. This device is designed to be simple and cheap. It offers a basic but attractive user interface, and in typical Apple fashion, works hard to hide a lot of extraneous details. Apple markets it as needing a widescreen enhanced definition TV, but it outputs standard definition NTSC 480i/p and PAL 576i/p, so any fairly modern TV with component video inputs can work with it. Apple TV is a simplified Mac with a video card supporting a 1280x720 resolution display. It's not the fanciest video card, but it's faster than what's in the Mac minis. That's because Apple TV relies on the video GPU to do most of its work while the main processor idles along in power saving mode. Apple TV would make a sluggish desktop computer, but it works fine for what it's designed to do: act as an iPod for widescreen TVs. Like the iPod, its processing capacity is tuned entirely for low power playback; unlike the iPod, it can also decode H.264 720p HD video, thanks to its dedicated video card. 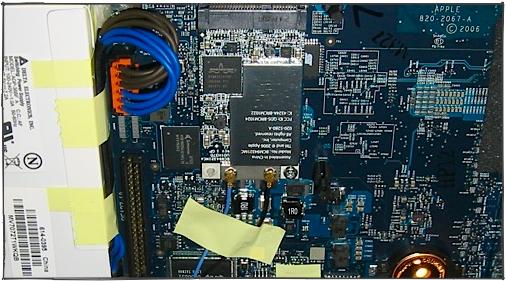 While the video card internally paints a 1280x720 display, its video circuitry adapts the picture for display on TV, just like any other Mac with video output. The display resolution can be downscaled to 480p (720x480), displayed at native 720p, or upscaled to 1080i (1920x1080), but its the same 1280x720 display in all cases. The i and p designations relate to whether video uses interlaced or progressive scan. Interlaced video draws a frame using two fields, essentially drawing the odd lines followed by even lines. Old sets required this because drawing every line in progressive sequence resulted in flicker, as the top would begin to fade before the bottom of the screen was drawn. Modern TV tubes don’t need interlacing, and flat panel LCDs illuminate the entire screen continuously. While 1280x720 is far higher resolution than standard TVs have seen in the past, some purists might complain that the Apple TV wasn't held up until 1080p became commonplace. These same gold plated adapter people also complain that the iPhone won't initially support the scant 3G mobile networks available in the US, and that iTunes doesn't deliver audiophile quality songs downloads for playback on the iPod. Fortunately, Apple is more concerned with delivering a useful product than touching buzzwords. The iPod video dock offers composite video and S-Video output, but these can't support HD signal quality for HDTV sets. The Apple TV is essentially an iPod tuned for HD content. Right now, that means viewing your own video, photos, and iTunes trailers. In the future, it will expand to include other HD video downloads from iTunes. Original black and white TV in 1941 used one signal to paint pictures on the screen: brightness or luma. The luma signal works like a yarn of thread, oscillating up and down to specify how light or dark each dot on the screen should be as it rapidly weaves out a picture from left to right, one line at a time. When color was added in the early 50s, rather than rendering all the existing black and white TVs obsolete, it was decided that the color system had to work with existing sets. Engineers found that of the three primary colors could be distilled into a luma signal for use by existing black and white sets, while the color information could be encoded together an a separate chroma signal, broadcast in parallel. Using both signals, color sets can decode three primary colors, and paint a full color picture. One TV channel is actually an FM radio broadcast for audio plus two AM radio broadcasts: one delivers the luma signal, the other the chroma signal. Incidentally, that's why some appliances like hot air popcorn makers can interfere with a broadcast picture without affecting sound: it blows out AM reception without affecting FM. Color TVs receive both picture signals, while black and white sets could simply ignore the chroma signal. This system also enables signaling to devote more bandwidth to the luma signal, since the eye can see more difference in brightness detail than it can in color. While technology has progressed dramatically since the early 50s, television standards have remained rather static. The main improvements for TV involved delivering the same signal with less interference. The advance of consumer S-Video jacks in the late 80s simply delivered the luma (Y) and chroma (C) signals on separate wires to minimize signal distortion better than a simple composite video jack, which carries both signals together on the same wire. The Apple TV's standard component connectors isolate three high-quality signals on three separate cables. While the connectors are color coded as red, green, and blue, component video actually delivers a luma (Y) signal and two other chroma signals that are transmitted as the difference between the luma and red (P-r) and luma and blue (P-b) signals. Component video ports are therefore labeled with the inscrutable Y Pb Pr, as well as being color coded as they are here on my 4 year old TV. Some are also labeled YUV, which relates to the color model used. 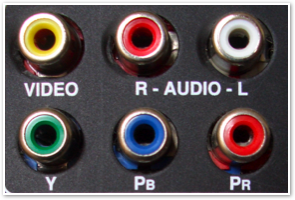 Both the digital HDMI and analog component video cables can deliver HD video, while composite video--commonly color coded in yellow--or S-Video cables simply can't. 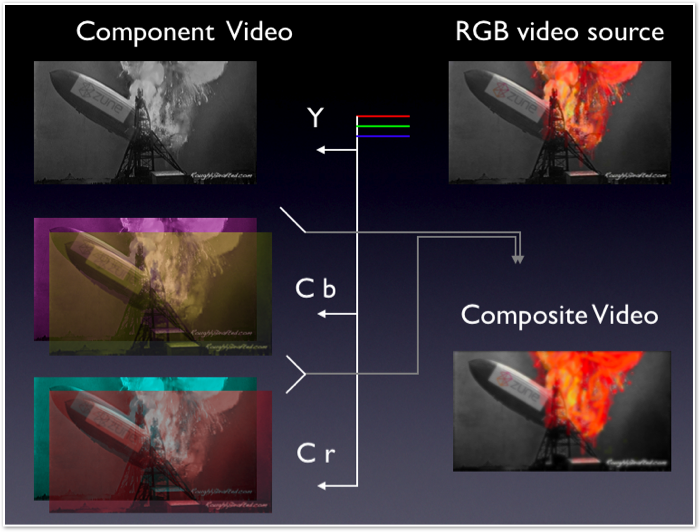 For Apple TV to support earlier TV sets, it would have to include the video circuits to scale its 1280x720 display into a composite signal, or alternatively S-Video, just like the iPod video dock. That would result in a display that looks like the iPod in TV mode, or a Tivo or PlayStation: okay for games and standard TV, but poor for titles and text displays and highly limiting the future applications of the device. Apple TV is a regular Mac running Mac OS X 10.4.7. It appears to be running a special Front Row application instead of the usual Finder, and does not have active support enabled for the included USB port. Simply being a regular Mac makes the box a wide open system with a lot of potential. Apple will be able to deliver new features as simple software updates, and even users will be able to extend its core features. Its 40 GB hard drive is partitioned into a 900 MB system volume called OSBoot, with the remainder allocated to a second volume called Media. The actual Mac OS X boot disk consumes about half of the 900 MB partition. It's a standard HFS+J formatted drive, so it can be removed and imaged onto a larger device to provide more storage capacity. Since it's a laptop sized drive, there are practical limitations that make using a disk larger than around 200 GB fairly impractical in terms of cost. One common request among file sharers is support for pirate video codecs, principally DivX and XviD. While QuickTime running on a PC or Mac can play those formats after installing the necessary codecs, the iPod can't, because it is engineered to play MPEG-2 and H.264 video using hardware decoding. It lacks the general purpose processor to decode other formats using software. The Apple TV doesn't have that problem; it has both a general purpose CPU and a dedicated video card. The Something Awful forums detail how users have pulled the Apple TV's hard drive and installed new QuickTime codecs to add the ability to play other video formats. They also installed an SSH client to allow remote control of its command line. Apple can't include codecs for some formats, either because they are not free, or because they involve patent issues. Neither issue is a problem for end users who choose to install codecs for their own use, however. One issue still being looked at is how to get alternative formats to the device; as is, the built-in Front Row interface only copies files it knows it can play, just like the iPod. The current alternative is to reencode files from other formats into formats the Apple TV can play natively using QuickTime, but that can be a very slow process for large amounts of video. Unlike the Xbox 360 when used as a Media Center Extender, the Apple TV doesn't really stream video from iTunes. Instead, iTunes fires the entire file over, either in advance using the sync feature from the main computer running iTunes, or on demand from any one of five different iTunes machines. That means the Apple TV always holds the file it is playing and, like a Tivo, can replay and fast forward. 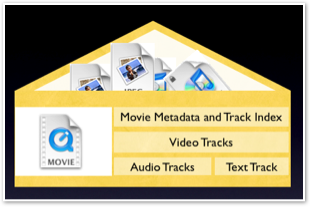 It can also start playing the file before it finishes being copied over, just like a QuickTime movie trailer on the web. In true streaming, the file is sprayed over in real time for immediate playback, and the receiving client doesn't usually need high processing power for decoding; a device can merely relay video. However, streaming is also more problematic to deliver without glitches and interruptions. On the Apple TV, the hard drive acts as a giant buffer so that content plays back more reliably. The other obvious difference between the Apple TV and the Xbox 360 from a design standpoint is that Apple TV is intended to be sold at a profit for $300. The 360 only began breaking even after millions were sold at a loss. That’s why Apple isn't threatened by users installing alternative software; it only wants to sell hardware. Microsoft however, is trying to sell software, so alternative software is a threat, particularly if it replaces Windows Media or otherwise reduces users’ dependance upon Windows. Of course, the real threat to Windows Media won't be from users trying to install Linux and Ogg on the Xbox to watch their own MythTV recordings, but rather from a competitive marketplace where producers are encouraged to use standard and open file types. Just as iTunes saved MP3 and popularized the royalty free and open AAC format, Apple TV looks poised to generate new demand for video using standard MPEG encoding and container formats, rather than Microsoft's proprietary new codecs and AVI/ASF containers. Piper Jaffray's Gene Munster estimates sales of 2 million Apple TV by the end of the year, suggesting sales of 700,000 by June. The Apple TV will likely sell a million units long before the Zune does! While the installed base of Xbox 360s and Media Center users is closer to ten million, the installed base of iPod and iTunes users is well over 100 million, giving Apple a long lead and suggesting the potential for the Apple TV to quickly eclipse the 360 as a TV media sharing device. Of course, the Xbox 360's main role is a game console. That role demands more expensive hardware features, a louder fan, and a larger box, all of which contribute to the 360 being less profitable and less attractive as a TV distribution box. It’s also, of course, far more complex to set up and start using as a Media Center Extender, making comparisons with the Apple TV fairly pointless. Gamers who want to find extra uses for their 360 might find it useful as a Media Center Extender, but regular people will find the Apple TV to be a product that, like the iPod, just works.